Funny bidness: tidbits of business news to inform and amuse. Rent a grave: How long before this business model reaches the U.S.? Hong Kong is struggling with a new scam; grave robbery. In HK, you see, you don't buy a grave site in most graveyards; you rent one for ten years. At the end of your lease your remains are removed, cremated or reburied in a smaller plot. If the corpse is not fully decomposed, though, it is reburied to age for another six months. However, it seems that some overeager graveyard owners have been pushing the clock, turning over their inventory in less than the required decade. An investigation code-named "Mid-Summer Night" resulted in the arrest of 18 people for early disinterment. Guinea Pig Network: We've written before about the opportunity to make money as a medical study guinea pig. Now a newsletter, Guinea Pig Zero, has been launched to share news and information on bioethics, current research and 'true stories of guinea pig adventure." The best of the journal is also collected in a print anthology, Guinea Pig Zero. Could be interesting reading; just imagine the adventures! 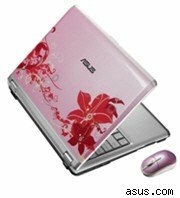 Scented laptop now available: I never realized what my laptop lacked until I read about Eee PC's newest line of laptops. A special edition comes with a built-in scent. Why be captive to the funk of the classroom or BO of the city bus when you can log on to the smell of the ocean, or a rich musk, or the essence of morning dew and floral blossom. Each laptop features artwork to match the scent. To attract the computer geeks, however, I would think they should offer models with the essence of Slim Jims and Diet Pepsi. Or sweet, sweet bacon.